A conversation with Jodi Kim (Department of Ethnic Studies, UC Riverside) and Joseph Keith (Department of English, Binghamton University), moderated by Crystal Parikh (Department of Social & Cultural Analysis, NYU). Jodi Kim is an Associate Professor of Ethnic Studies at UC Riverside. Her research and teaching interests deal with the intersections of Asian American studies, critical ethnic and race studies, postcolonial theory, and feminist epistemologies. Her book Ends of Empire: Asian American Critique and the Cold War (University of Minnesota Press, 2010) offers a critique of American empire in Asia through an interdisciplinary analysis of Asian American cultural productions and their critical intersections with Cold War geopolitics and logics. 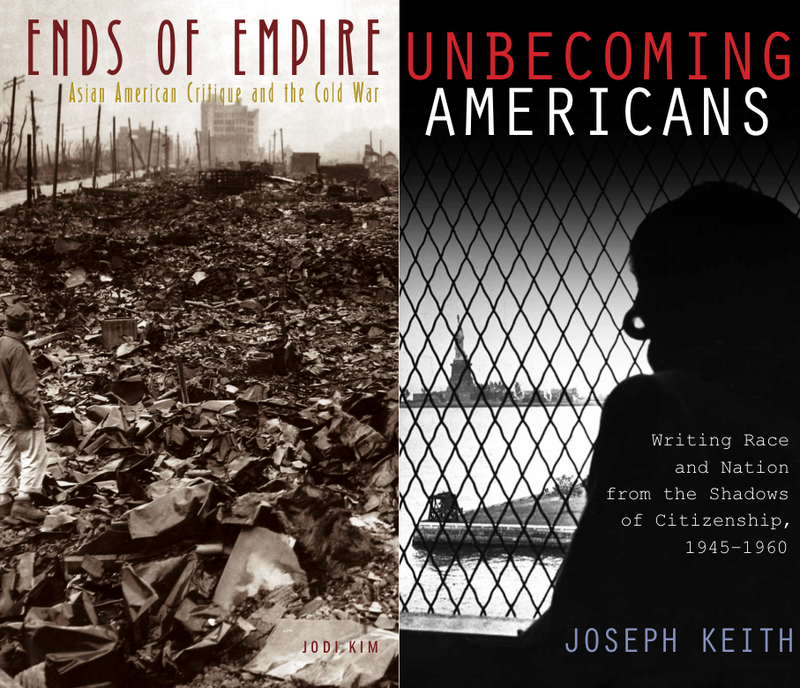 Joseph Keith is an Associate Professor of English at Binghamton University. His areas of interest include Modern U.S. and British Literature, Comparative Imperialisms, Marxism and Marxist Cultural Studies, and Postcolonial Theory. His book Unbecoming Americans: Writing Race and Nation from the Shadows of Citizenship, 1945-1960 (Rutgers University Press, 2012) sets out to recover the shadow narratives of un-American writers forged out of the racial and political limits of citizenship, and focuses on the Cold War-era criminalization of “un-assimilable” American citizens (from left-wing intellectuals and black radicals to racialized migrant laborers) through the denial and curtailment of citizenship and rights. Crystal Parikh is an associate professor in the Department of English and the Department of Social and Cultural Analysis at New York University. Her areas of research and teaching include Asian American studies, Latino studies, critical race theory, theories of gender and sexuality, and twentieth-century American literature. Professor Parikh has recently published An Ethics of Betrayal: The Politics of Otherness in Emergent U.S. Literature and Culture with Fordham UP and is currently working on a new book about human rights discourses and contemporary U.S. writers of color. Co-Sponsored by the Asian/Pacific/American Institute, NYU Postcolonial Seminar, Department of English, American Studies Program, and Humanities Institute.